In order to understand the brain's response to Spinal Cord Injury, we need to understand the interaction and relationship between the brain and the Spinal cord. Lets try and make it easy! The Spinal cord is about the diameter of a human finger and descends from the brain, down the middle of the back. It consists of millions of nerve fibres which transmit electrical information to and from the limbs, trunk and organs of the body, back to and from the brain. The spinal cord is surrounded by a clear fluid called Cerebral Spinal Fluid (CSF), that acts as a cushion to protect the delicate nerve tissues from damage from banging against the inside of the vertebrae. The nerves which carry information from the brain to muscles are called Motor Neurones. Sensory Neurones are the nerves which carry information from the body back to the brain It is these Sensory Neurones that tell your brain that you feel pain and about your skin temperature and touch. Of course this is what happens with 'normal function' but for those with Spinal Cord Injury this process is affected. The brain tries to make some sense of what is going on with the body and thats not an easy task and where we feel the issues. After my injury, I needed to make sense of what was going on with my body, I asked every specialist or medical person I came into contact with. The answer was 'Its damaged nerves' That answer just is not good enough. My brain may not be able to connect efficiently with my body but my logic is still intact so let me process this understanding, explain to me...! In the end I carried out my own 'research' because it was a strong internal need to make sense of all this oddness that I was experiencing. My feet taught me the best understanding possible with this dysfunction of the nerves that we compressed and this unable to do their job. 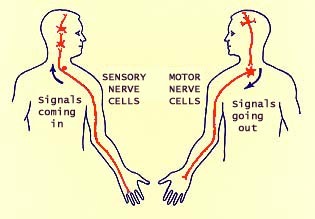 By the way, i just wanted to say, isn't it funny when we read about our badly behaving 'interrupted' signals when talking of nerve damage and loss of movement. Anyways, back to my feet, my brain tries to figure out what is going on here, some signals although interrupted reaches my feet and then goes tell my brain they are on fire! I expect that my brain isnt getting any signal back that makes any logic so it goes back to tell my feet they are on fire and all that just so I check up they are still there because as far as my brain goes, I could have had them amputated and it wouldn't register. I hope this makes some sense, im going to do a bit of a series of posts on this just so we can make some sense of it. Very good post Lara!! It is amazing that the burning and freezing can be felt but normal sensation and movement is virtually dead. I wish I could understand it all and maybe it would be more acceptable if I could. Probably not but possible. When I put my mind to something, i become determined! I am going to post on this subject every day until it fits together like a jigsaw! It won't change anything but it will make sense. So we know that the brain works with the spinal cord to to co ordinate movements within the body and to understand/communicate what we feel and where we feel. For a person with no dysfunction this works great and to be honest for most people, they never give it a second thought, unless, of course, you have suffered a Spinal Cord Injury because here is where it changes. The minute there is damage to the nerves that carry these messages, things change for us. In our case, degree of movement and what we feel changes. Our legs or other parts didnt incidentally stop working, there just isnt the communication link to tell them to move...Our body is still function-able but it is being prevented from doing so because of this disruption. It would seem to be so simple and yet it is as as complex as it is simple! The anatomy of the spinal cord itself, The nerves which exit the spinal cord in the upper section, the neck, control breathing and the arms. The nerves which exit the spinal cord in the mid and lower section of the back, control the trunk and legs, as well as bladder, bowel and sexual function. 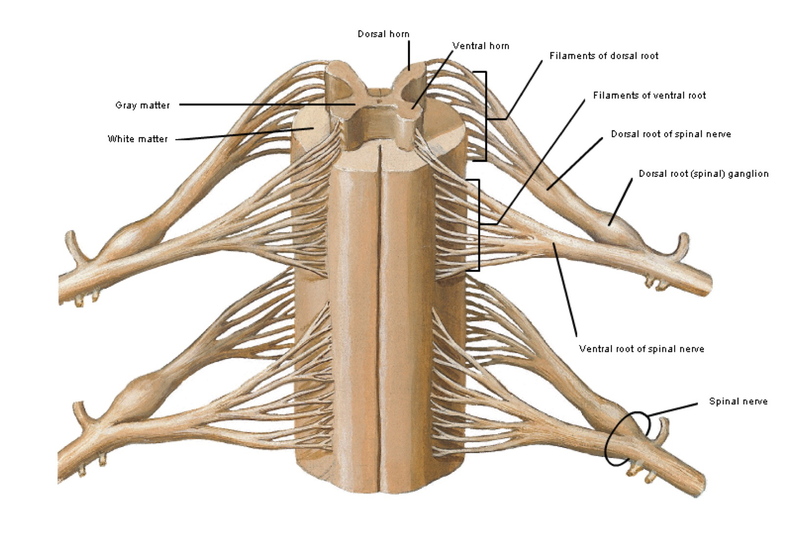 Of course this is only general, we can look at each section of the spinal cord and every level to which nerves lead to which muscles and what issues that may cause in relation to nerves being unable to carry these signals. Lumbar refers to the nerves within the lower section of the spinal cord. Each of these sections are responsible for carrying messages from the brain to parts of the body and then back up through the spinal cord to the brain, this completes the process of initiating movements. Good post indeed Lαrα! For me it seems that some sensory neurons are passing through but no motor neurons. I am a T-10 Complete Asia "A". I have no lower motor neurons funtioning. I hope someday they can fire some up to get rid of all my atrophy in the legs. I was a marathon runner prior to Sci and had really strong hamstrings and calves. Now I have loose skin pencil stick legs. They make me sick to look at them. I know research is trying to make us walk but I can't understand why they don't concentrate on Neurons in a stronger way. 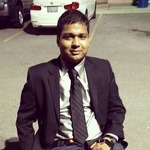 It seems the brain , cord , neurons are together and if they could fire them up in the body it would be a milestone hit. All of us could gain muscle and not worry about broken bones. I laugh when I see the ice and feet. I did a clinical study just like that. 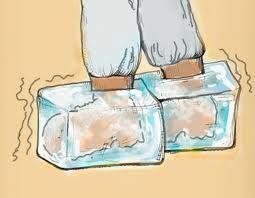 They wire you up and have your feet in ice cubes. They measure bodies temperature change and see if the body reacts different. Unfortunately they was no change for me. I guess damage at my level effects the nerves really bad to deaden the neurons. Hopefully someday research will succeed. It would be a Blessing just to regain B & B again. Also to feel my feet. joemonte,its funny business for sure isnt it. You really think it would be easier than this to re-wire and kick start the nerves. There just seems to be a missing link, just like the missing bridge for the nerves to connect. The brain is still trying to continue to do its job. Hopefully research will find something to fire up these Neurons. I feel they should concentrate on the smaller things then walking right now. Sure would like to have it all , but if I can get some feeling back it would make a world of difference for many of us. Absolutely joemonte,this is an important factor. There is so much focus on 'cure' that as you say sensation would be a bonus....Walking isnt everything, after all, not when there is sexual dysfunction, limited hand movement, bladder and bowel dysfunction. I wonder how much money is distributed to researching sexual dysfunction? Yes DJ, if you have feel in these areas yet no movement, sensory neurons are making their way back to your brain via your spinal cord, so you have at least, some ability to feel. I just sit and stare at the images trying to figure it all out. Of course I can't but it gives me some idea as to what is going on in my body. My injury was 19 years ago and I sure wasn't given much info then. I couldn't tell you what ASIA I am and no one has even bothered to tell me. Until I found these SCI forums last year I was living in a bubble because I had never met anyone that "lived like I do". I've learned more through the forums than I have with any doctor. This is partly my fault because I gave up on them because I always felt as if I was being given the run around. It was almost as if they thought I was imagining these things. I assure them, at no time did I imagine having a bowel accident in public. Thankfully I have limited those to few and far between. My injury is L1-L2. I have been fortunate to walk with the assistance of AFO braces. My thighs are very muscular because they do all of the work. From the knees down I am skin stretched over the bone. I am very active and at times I am afraid I will snap a bone and put myself in a predicament. I'm not sure how common this is but it does stick in my mind. I would love to sit down with a neurosurgeon and get some of my questions answered. Are there things out there that could ease my pains, make my quality of life better and what I should or should not be doing. The new health care laws make getting a referral the same as getting an act of Congress as I have learned in the past few weeks with pain management. However, I am going to pursue this further because I have a right to know what is going on. I thank each of you for sharing your knowledge and experience and as I move forward I will definitely post anything and everything that I find out. jeff1967, I intend to be able to explain this in real easy terms soon, im building up to it! Im learning too..ive done lots of reading tonight and its coming together. The images are a guide at the moment....but they still need explaining. You sound like me actually, my thighs are good although sensation is impaired, my calf muscles are non existent as are my knee and ankle reflexes, my legs, saddle area and feet are mostly numb. Lαrα, Yes our legs do sound like they are the same LOL. Numb in the saddle are, no ankle reflexes and 99% of my feet have no sensation at all and where it does it is very faint. Apologies for the quality of the images.. This image above is a cross section of the spinal column, you will see a green edged area near to the center of this image.This is the Ventral Root (Motor root) and this forms part of the spinal nerve along with the Dorsal (Sensory root) as you can see in the image below. The 'bulge' that you can see outlined in green is called the dorsal ganglion, the job of this is to help identify the sensory root of the spinal nerve. These images help to illustrate the how the signal leaves the spinal cord via the spinal nerves and travels to the spinal nerves from the body. They travel to and from parts of the body to initiate movement and feeling/sensation. Of course this is in 'normal' function. We can see by looking at these cross section images how trauma/disease can damage these crucial spinal nerves. So much depends on at what angle to the spinal cord the injury occurs to which nerves become the most damaged wether that be function or sensation or partly both or completely both. How long the cause of the damage remains compressing the nerves will dictate the degree and extent of damage. The injury level, spinal nerve level will dictate which parts of the body are affected and then some will depend on how well your body heals and of course how much nerve regeneration can take place.